Book review: Love, Life and Dreams by Rebekah Louise. I have to admit that at the moment I don't usually stray away from my favourite Authors. Furthermore, in all honesty, lately I have been struggling to find time to sit down and read, so when Rebekah Louise got in touch telling me about her short stories and how they were great for those with limited time, I thought it was the perfect chance for me to delve into a new Author and get a bit of reading in too. Rebekah was absolutely right in regards to short stories being a wonderful escapism for those that might just have a few minutes to read. In that sense, I would highly recommend this collection of stories for those of you in this situation. It was lovely to be able to sit down and read for a few minutes and feel like you are away in another world, without getting too caught up in having to read another chapter, when you really need to be working. However, I must admit that I am definitely one for wanting to get sucked into a book and know more about the lives of the characters and have that emotional connection. I really enjoyed Alice and Emma's story in the first read. I liked how the two sister's learnt from each other and were good for each other. Even though Emma had been through an awful lot of heartbreak, Alice gave her tough love and helped her to see that other people where there for her and she had to wake up and see that too. 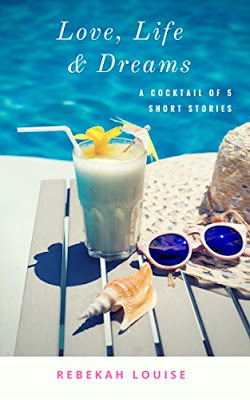 Their fun, girly holiday made for a lovely read and the ending was cool in that I felt I could almost imagine it in my head and think of a happy and positive future for Emma. I wasn't too fond of the second story. It was a little out there, but if you like a more creepy twist and to read stories a bit darker, then it might be for you. It involved deception, Quadruplets and some mean antics from all parties. Unfortunately I just couldn't connect with what the characters had done. The remaining three stories made for interesting reads too. They all had moments and people to learn from I feel, as they are not all happy and the characters aren't all sunshine and rainbows. They make you think. Louis and Emma's story is rather nice and Ania's story makes you think about life and all that you have to be grateful for. This collection of short stories was different for me and each one made for a unique read. If you're looking for a little burst of escapism then definitely check out Rebekah's Love, Life and Dreams' today. Happy reading and thank you Rebekah for sending me a copy of your lovely stories.